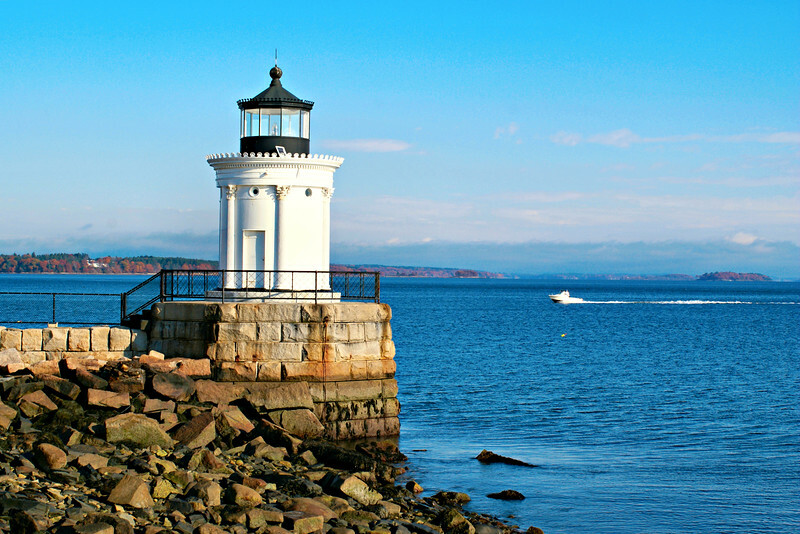 Located on the south side of the inner harbor of Portland, Maine the Breakwater Light has been guiding ships into the harbor since 1855. There have been two diminutive towers in the history of the light, earning the nickname of the 'Bug Light' from the locals. At one point its future looked uncertain, but it has been rescued and restored by the people of South Portland for the enjoyment of future generations. In the early 1830's several northeasters caused severe damage to buildings and wharves along the Portland waterfront. In order to protect the harbor it was decided to build a breakwater which would provide a refuge for ships. Construction began in 1837 and continued as money was appropriated. The breakwater eventually reached a length of 1,800 feet but never reached it planned length of 2,500 feet. Once it was built mariners complained the unlit breakwater was a shipping hazard. Therefore an appropriation of $3,500 was made in 1854 to construct a lighthouse at the end of the breakwater.